AEM has renamed its Injection Monitor the AEM Water/Methanol FAILSAFE Device. This unit is the most advanced water/methanol failsafe device on the market, as it actively monitors the injection system’s ENTIRE flow curve to compensate for failure under ANY condition, allowing you to use your water/methanol system with complete peace of mind. If you have a water/methanol injection system or are considering one, you will not find a more advanced failsafe device on the market than the AEM Water/Methanol FAILSAFE Device. AEM’s Water/Methanol FAILSAFE Device actively monitors the entire flow curve independent of pressure, continuously collecting flow vs. injection rate data so that any deviation from your established flow curve will trigger an alarm output that can be used to reduce boost or timing, change maps, add fuel, trigger a two-step or perform practically any action you choose to save your engine. It is PC programmable (with USB connectivity) which eliminates the guesswork when setting min/max threshold parameters. It features PC-based software and an auto-scaling flow map that simplifies set up, and has an “Auto Set” feature that will create a baseline configuration. A video showing its ease of set up is on www.aemelectronics.com. And it will work on virtually ANY water/methanol injection system that uses 1/4” OD or 4mm OD tubing! Should an alarm trigger, the AEM Water/Methanol FAILSAFE Device has one low-side (ground) driver and one high-side (+12v) driver that can be configured to turn on or off during an alarm condition. For instance, late-model Subaru WRX STi owners can connect the low-side driver to the “limp” wire behind the kick panel that will dump boost and pull timing via the factory ECU. If you have a supercharged Chevy 350cid small-block, you can use it to pull timing from a switched aftermarket ignition system. The possibilities are endless. 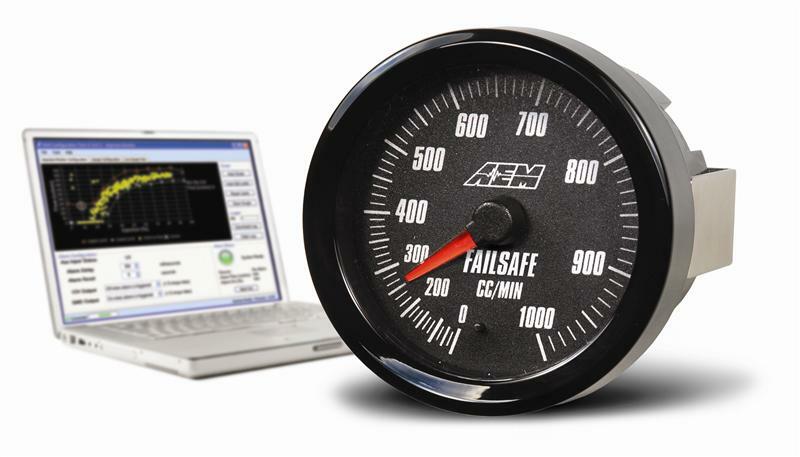 A high-tech analog gauge is included with the AEM Water/Methanol FAILSAFE Device, with programmable backlighting to match your factory gauges. The gauge needle and backlighting can be configured to flash when an alarm is triggered to notify of a potential system error. This system also includes an internal data logger that records injection and alarm status data for future reference.